Imagine a microscopic gold pill that could travel to a specific location in your body and deliver a drug just where it is needed. This is the promise of plasmonic nanovesicles. These minute capsules can navigate the bloodstream, and, when hit with a quick pulse of laser light, change shape to release their contents. It can then exit the body, leaving only the desired package. This on-demand, light-triggered drug release method could transform medicine, especially the treatment of cancer. Clinicians are beginning to test plasmonic nanovesicles on head and neck tumors. They can also help efforts to study the nervous system in real-time and provide insights into how the brain works. However, like many aspects of nanotechnology, the devil is in the details. Much remains unknown about the specific behavior of these nanoparticles - for instance, the wavelengths of light they respond to and how best to engineer them. Writing in the October 2017 issue of Advanced Optical Materials, Zhenpeng Qin, an assistant professor of Mechanical Engineering and Bioengineering at the University of Texas at Dallas, his team, and collaborators from the University of Reims (Dr. Jaona Randrianalisoa), reported the results of computational investigations into the collective optical properties of complex plasmonic vesicles. They used the Stampede and Lonestar supercomputers at the Texas Advanced Computing Center , as well as systems at the ROMEO Computing Center at the University of Reims Champagne-Ardenne and the San Diego Supercomputing Center (through the Extreme Science and Engineering Discovery Environment) to perform large-scale virtual experiments of light-struck vesicles. "A lot of people make nanoparticles and observe them using electron microscopy," Qin said. "But the computations give us a unique angle to the problem. They provide an improved understanding of the fundamental interactions and insights so we can better design these particles for specific applications." Gold nanoparticles are one promising example of a plasmonic nanomaterial. Unlike normal substances, plasmonic nanoparticles (typically made of noble metals) have unusual scattering, absorbance, and coupling properties due to their geometries and electromagnetic characteristics. One consequence of this is that they interact strongly with light and can be heated by visible and ultraviolet light, even at a distance, leading to structural changes in the particles, from melting to expansion to fragmentation. Gold nanoparticle-coated liposomes—spherical sacs enclosing a watery core that can be used to carry drugs or other substances into the tissues—have been demonstrated as promising agents for light-induced content release. But these nanoparticles need to be able to clear the body through the renal system, which limits the size of the nanoparticles to less than few nanometers. The specific shape of the nanoparticle—for instance, how close together the individual gold molecules are, how large the core is, and the size, shape, density and surface conditions of the nanoparticle—determines how, and how well, the nanoparticle functions and how it can be manipulated. Qin has turned his attention in recent years to the dynamics of clusters of small gold nanoparticles with liposome cores, and their applications in both diagnostic and therapeutic areas. "If we put the nanoparticles around a nano-vesicle, we can use laser light to pop open the vesicle and release molecules of interests," he explained. "We have the capability to assemble a different number of particles around a vesicle by coating the vesicle in a layer of very small particles. How can we design this structure? It's a quite interesting and complex problem. How do the nanoparticles interact with each other - how far are they apart, how many are there?" To gain insights into the ways plasmonic nanoparticles work and how they can be optimally designed, Qin and colleagues use computer simulation in addition to laboratory experiments. 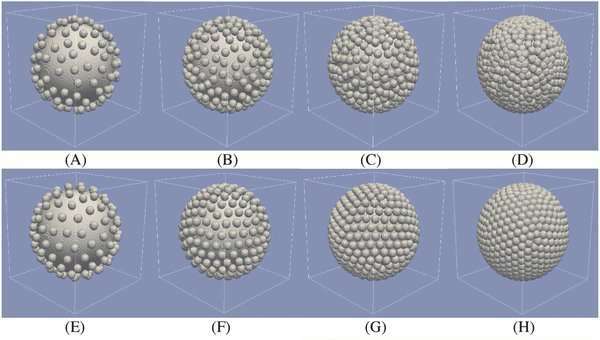 In their recent study, Qin and his team simulated various liposome core sizes, gold nanoparticle coating sizes, a wide range of coating densities, and random versus uniform coating organizations. The coatings include several hundred individual gold particles, which behave collectively. "It is very simple to simulate one particle. You can do it on an ordinary computer, but we're one of the first to looking into a complex vesicle," Randrianalisoa said. "It is really exciting to observe how aggregates of nanoparticles surrounding the lipid core modify collectively the optical response of the system." 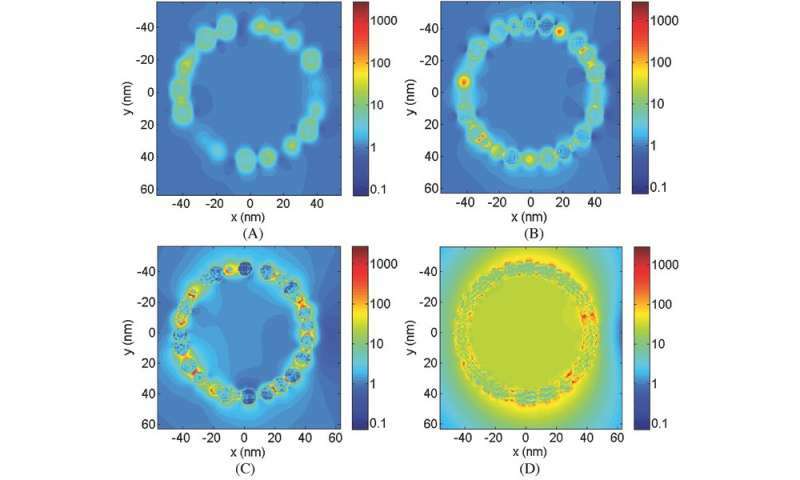 The team used the discrete dipole approximation (DDA) computation method in order to make predictions of the optical absorption features of the gold-coated liposome systems. DDA allows one to compute the scattering of radiation by particles of arbitrary shape and organization. The method has the advantage of allowing the team to design new complex shapes and structures and to determine quantitatively what their optical absorption features will be. The researchers found that the gold nanoparticles that make up the outer surface have to be sufficiently close together, or even overlapping, to absorb sufficient light for the delivery system to be effective. They identified an intermediate range of optical conditions referred to as the "black gold regime," where the tightly packed gold nanoparticles respond to light at all wavelengths, which can be highly useful for a range of applications. "We'd like to develop particles that interact with light in the near-infrared range - with wavelengths of around 700 to 900 nanometers—so they have a deeper penetration into the tissue," Qin explained. They anticipate that this study will provide design guidelines for nano-engineers and will have a significant impact on the further development of complex plasmonic nanostructures and vesicles for biomedical applications. Inspired by recent developments in optogenetics, which uses light to control cells (typically neurons) in living tissues, Qin and his team plan to use the technology to develop a versatile optically-triggered system to perform real-time studies of brain activity and behavior. He hopes the fast release feature of the new technique will provide sufficient speed to study neuronal communication in neuroscience research. "There are a lot of opportunities for using computations to understand fundamental interactions and mechanisms that we can't measure," Qin said. "That can feed back into our experimental research so we can better advance these different techniques to help people."